On top of your head? At the nape of your neck? That's all up to you, and anything you think looks good is good. I'm talking about how you physically put the veil on your head. 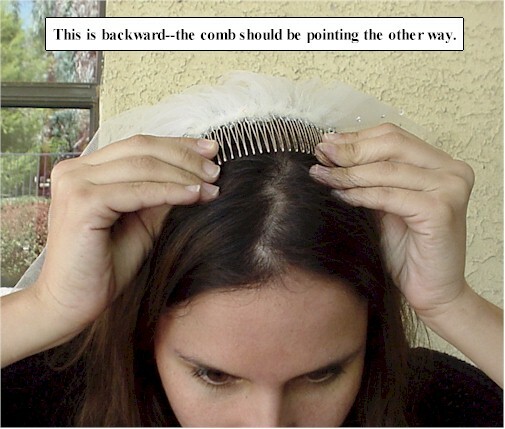 Just remember: the teeth of the comb should always point either down or back. Never toward your face, never toward the sky. Even if you're wearing the comb under your up-do. 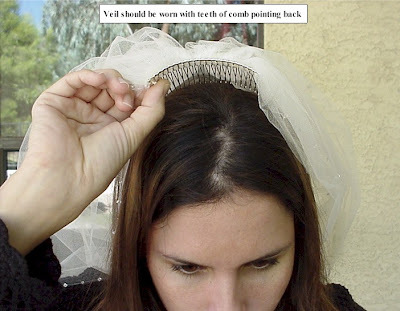 If you're wearing your veil at the back of your head, it can be tremendously helpful to take the veil with you to the salon and let the stylist place the veil. If you're wearing an extremely low chignon, and there simply won't be any room beneath the hair to place the veil, a far better option than wearing the veil upside down is using bridal loops rather than a comb. Bridal loops aren't quite as secure, but your veil will look better and will be more secure than if you try to wear your veil backwards.